In our ongoing quest to bring you unbiased reviews of the hottest dating sites we are putting BlackPeopleMeet.com through the paces. Let’s see how well this profile ranks. How many children do you have? None… I’ve never been pregnant, but it seems to happen to a lot of the women around me. A little about me us: First of all we’re a team. This is non-negotiable. Good news for you, you get to kill two birds with one stone, and by birds I mean dicks, and by kill I mean love. I’d just like to add: We run a high scale dating site. Viewing this profile has entered you in our database. You will now receive hourly updates of our relationship status until you go out with us. Your profile has been viewed 18 time(s) since you last logged in. You also have 1 new flirt(s) and 1 unread message(s). Your profile has been viewed 23 time(s) since you last logged in. You also have 1 new flirt(s) and 1 unread message(s). 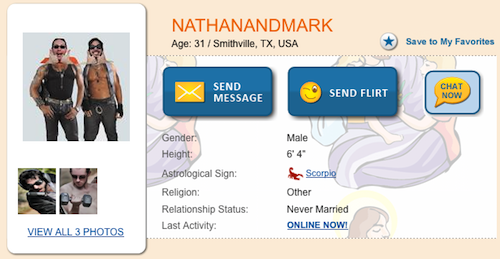 NathanAndMark, you have new flirts.